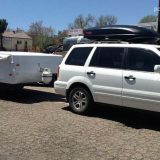 Winterizing your camper is pretty easy with the right parts and process. 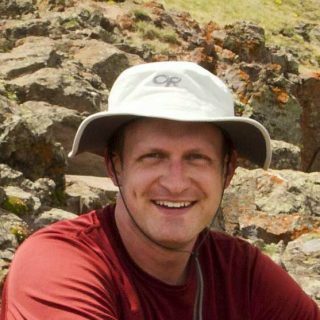 This post shows how to complete this important task in less than 20 minutes. 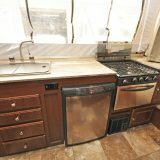 There are quite a few expensive parts inside your camper that could be damaged by frozen water, including the water reservoir tank, water pump, water filter canister, hot water heater, cassette toilet, and even the faucet and shower heads. 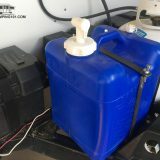 You do NOT want to use automobile antifreeze, which is highly toxic to both your camper and anyone digesting liquid remaining in the water lines. Purchase biodegradable and non-toxic RV antifreeze – the pink stuff! Two gallons is usually sufficient. 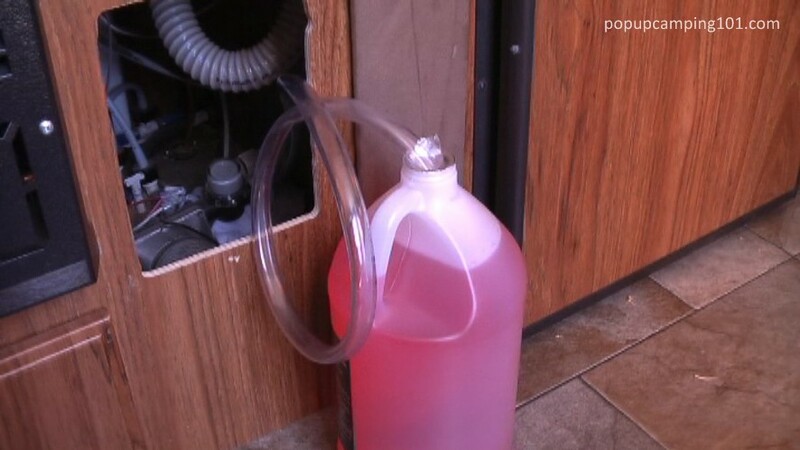 You don’t want a bunch of antifreeze getting all over your camper’s exterior, so make sure your grey water discharge hose is connected to drain the pink stuff directly to the ground. It’s not necessary or recommended to put antifreeze in your water heater. 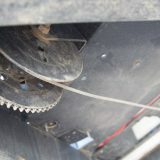 Instead, you simply enable the hot water heater bypass from the interior of the camper and then drain the water from the exterior of the water heater by removing the anode rod. Congratulations – this step alone protects your $500 water heater from freeze damage. Simply disconnect the water pump from the water reservoir tank and instead pump antifreeze directly from its plastic container. 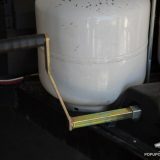 A screw-on connector can be found at most hardware stores and then connected to a tube which you simply dunk into a gallon of antifreeze. You’re now ready to pump antifreeze throughout your camper. Now that your water pump is pulling antifreeze, simply turn on your sink faucet to winterize. Remember to do both the hot and cold water. Even though your hot water heater is bypassed, you still need to winterize the hot water lines going to and from the heater. Let enough antifreeze flow out from the faucet to make sure your sink discharge tube and p-trap are also full of pink stuff and thus winterized. While you’re inside the camper, winterize the interior shower by turning on the hot and cold knobs (separately) until pink antifreeze runs out. Keep your shower basin clean by taking the shower head outside and discharging the water there instead. But don’t forget to pour some antifreeze into the shower drain to winterize the discharge tube and p-trap there like you did with the sink. The cassette itself can be removed for cleaning and drying. However, all of the fresh water used for flushing must be drained, first from the fill tube and then from the clear plastic tube. Same drill as the sink faucet and inside shower. First crank on the cold water until pink antifreeze flows, then switch to hot. This part is easy – simply drain all the water out of your reservoir. Try the tire ramp mod to angle your camper and make sure all the water truly drains out. You can go ahead and hook the water reservoir line back up to your water pump so it’s ready to go when temperatures warm up. 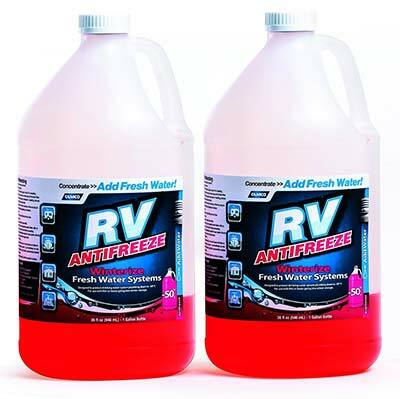 And remember that while RV antifreeze also sanitizes your water lines and faucets, you’ll want to sanitize the water reservoir with a mild bleach solution before using it again. See below for a comprehensive video of all the steps listed above. You can access this video directly on YouTube at http://youtu.be/7Ey26ejGVxE, including watching in your mobile device while performing the steps. If you ever find yourself out camping when temperatures drop unexpectedly, check out the Emergency Winterization post for some quick tips on minimizing damage when the full winterization steps above aren’t possible. Easier said than done. I place a small piece of pink duct tape on the water pump switch and all of the faucets so my family knows not to turn them on. I also attach some pink duct tape to the sink drain strainer so nothing gets dumped down the sink that could potentially freeze in the discharge tube and p-trap. Most of the steps above apply to connecting an air compressor to the air pump instead of antifreeze, although you would NOT want to turn the pump on. This pushes water out each faucet through air pressure. Antifreeze is recommended for two reasons. First, it sanitizes your lines while it sits, eliminating a bleach sanitization when de-winterizing your lines (although you still need to sanitize the water reservoir tank). Second, and even more important – using an air compressor could miss some spots, allowing air to flow over water without flushing it out completely. This water could freeze and crack expensive components.